Short answer: To provide more shoppers for the local businesses. Read on for the longer answer. Over on Chicago Cityscape I added a new feature called “market analysis” which measures the number of people who live within specific walking areas (measured by time) and driving areas (measured by distance). I am in favor of removing apartment & condo bans in Chicago, especially in areas where they were previously allowed and near train stations. Jefferson Park is centered around two co-located train stations, serviced by CTA and Metra respectively. There have been multiple proposals for multi-family housing near the stations (collectively called the Jefferson Park Transit Center) and some have been approved. Always, however, there are residents who resist these proposals and the number of originally proposed apartments or condos gets reduced in the final version (classic NIMBYism). To support the first reason, I used the “market analysis” tool to see just how many people live in a walkable area centered around Veterans Square, a mixed-use office and retail development adjacent to the train stations. Only 9,368 people live within a 10 minute walk to Veterans Square (get the Address Snapshot). Comparatively, 19,707 people live within a 10 minute walk to The Crotch, or the center of Wicker Park, at the intersection of Milwaukee/North/Damen (get the Address Snapshot). The Blue Line station is about 75 feet south of the center point. I would grant the low Veterans Square number a small discount based on the proximity to the Kennedy Expressway, which severely truncates walking areas up and down the northwest side. Still, even with that discount, ending up with less than half the amount as the one in Wicker Park, is disturbing. Wicker Park is hardly characterized by high-density housing. In fact, all of the new high-rises are just outside the 10 minute walk shed! Is it possible for us to “greenline” neighborhoods? Maps have been used to devalue neighborhoods and to excuse disinvestment. 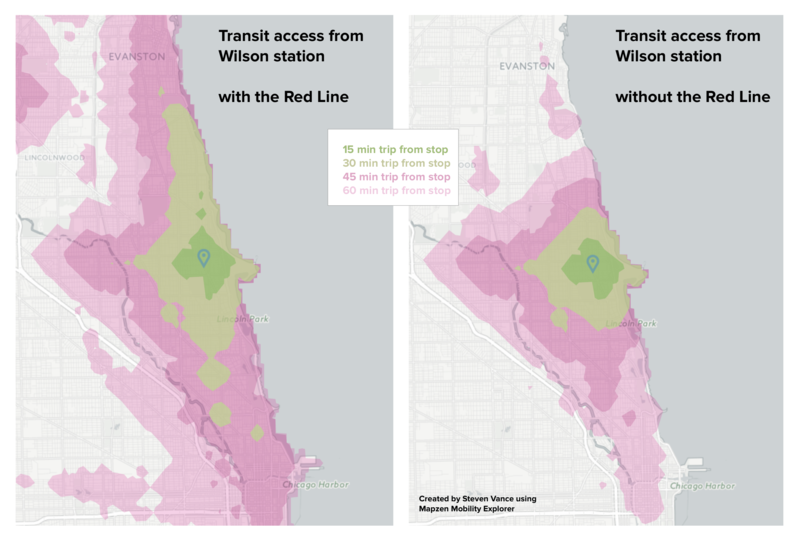 There should be maps, and narratives, to “greenline” – raise up – Chicago neighborhoods. The Home Owners’ Loan Corporation “residential lending security” maps marked areas based on prejudicial characteristics and some objective traits of neighborhoods to assess the home mortgage lending risk. (View the Cook County maps.) The red and yellow areas have suffered almost continuously since the 1930s, and it could be based on the marking of these neighborhoods as red or yellow (there is some debate about the maps’ real effects). The Home Owners’ Loan Corporation and its local consultants (brokers and appraisers, mostly) outlined areas and labeled them according to objective and subjective & prejudicial criteria in the 1930s. Each area is accompanied by a data sheet and narrative description. 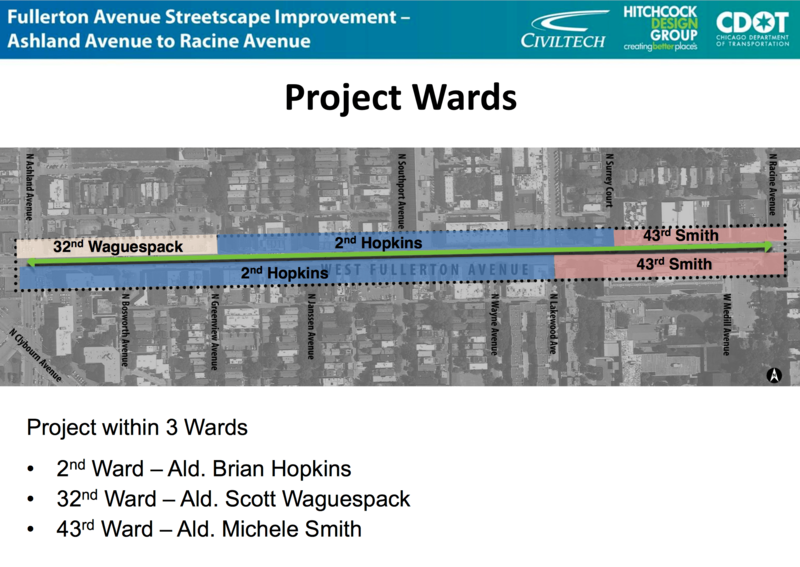 The image is a screenshot of the maps as hosted and presented on Chicago Cityscape. I might be thinking myopically, but what would happen if we marked *every* neighborhood in green, and talked about their strengths, and any historical and current disinvestment – actions that contribute to people’s distressed conditions today? One aspect of this is a form of affirmative marketing – advertising yourself, telling your own story, in a more positive way than others have heard about you in the past. This area is bounded on the north by Lake St., on the south by Columbus Park, and on the west by the neighboring village of Oak Park. The terrain is flat and the area is about 100% built up. There is heavy traffic along Lake St., Washington Blvd. Madison St., Austin Ave. (the western boundary) and Central Ave. (the eastern boundary). High schools, grammar schools, and churches are convenient. Residents shop at fine shopping center in Oak Park. There are also numerouss small stores along Lake St., and along Madison St. There are many large apartment buildings along the boulevards above mentioned, and these are largely occupied by Hebrew tenants. As a whole the area would probably be 20-25% Jewish. Some of this migration is coming from Lawndale and from the southwest side of Chicago. Land values are quite high due to the fact that the area is zoned for apartment buildings. This penalizes single family occupancy because of high taxes based on exclusive land values, which are from $60-80 a front foot, altho one authority estimates them at $100 a front foot. An example of this is shown where HOLC had a house on Mason St. exposed for sale over a (over) period of two years at prices beginning at $6,000 and going down to $4,500. it was finally sold for $3,800. The land alone is taxed based on a valuation exceeding that amount. This area is favored by good transportation and by proximity to a good Catholic Church and parochial school. There are a few scattered two flats in which units rent for about $55. Columbus Park on the south affords exceptional recreational advantages. The Hawthorne Building & Loan, Bell Savings Building & Loan, and Prairie State Bank have loaned in this area, without the FHA insurance provision. The amounts are stated to be up to 50% and in some cases 60%, of current appraisals. Age, slow infiltration, and rather indifferent maintenance have been considered in grading this area “C”. Infiltration is a coded reference to people of color, and Jews. How would you describe this part of Austin today to stand up for the neighborhood and its residents, the actions taken against them over decades, and work to repair these? How do you change the mindset of investors (both small and large, local and far) to see the advantages in every neighborhood rather than rely on money metrics? What other kinds of data can investors use in their pro formas to find the positive outlook? What would these areas look like today if they received the same level of investment (per square mile, per student, per resident, per road mile) as green and blue areas? How great was the level of disinvestment from 1940-2018? In the midst of writing this, Paola Aguirre pointed me to another kind of greenlining that’s been proposed in St. Louis. A new anti-segregation report from For the Sake of All recommended a “Greenlining Fund” that would pay to cover the gap between what the bank is appraising a house for and what the sales price is for a house, so that more renters and Black families can buy a house in their neighborhoods. That “greenlining” is a more direct response to the outcome of redlining: It was harder to get a mortgage in a red area. My idea of greenlining is to come up with ways to say to convince people who have a hard time believing there are qualities worth investing in that there they are people and places worth investing in. The Digital Scholarship Lab at the University of Richmond digitized the HOLC maps and published them on their Mapping Inequality website as well as provided the GIS data under a Creative Commons license. The area in green only allows single-family houses to be built. This is all of the land area within two blocks of the Bloomingdale Trail that allows only single-family housing to be built (view full map). This isn’t to say that multi-family housing doesn’t exist here; it definitely does, and there’s probably a handful of two-flats on a majority of the blogs. 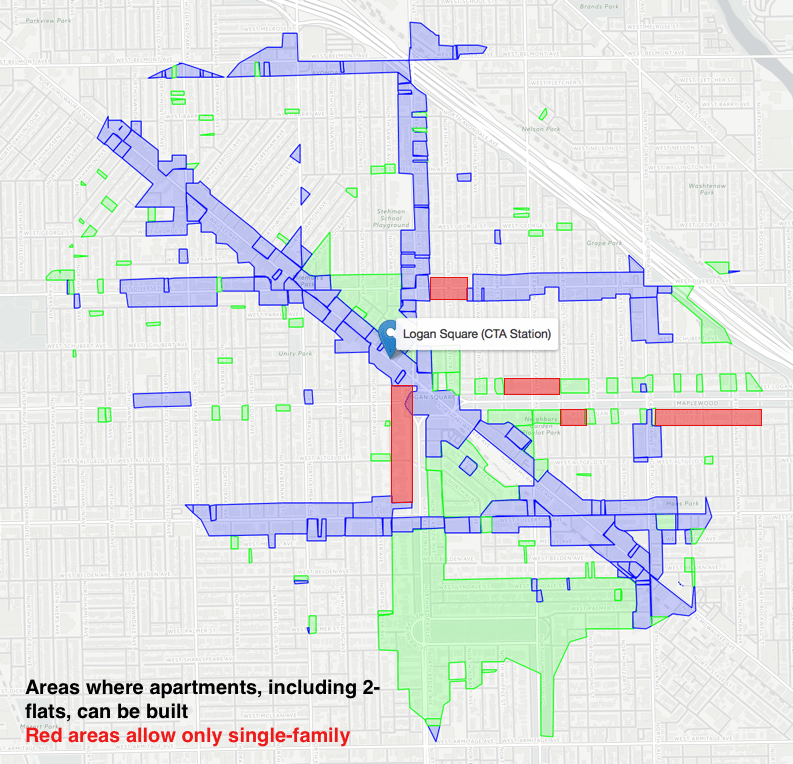 All of the five parks of the 606 are within this two block radius, and 49.6 percent of the land allows only single-family housing to be built. But why build a transportation corridor, a park, a new, expensive, public amenity, and not change the kind of housing – which often determines the kind of family and makeup of a household – that can afford to buy a home near here. It’s already been shown that detached single-family housing prices have grown intensely the closer you get to the trail. That price growth has meant displacement for some, and “no chance to buy or build a house here” for many others. There are still plenty of vacant lots within the mapped area; lots that should have a 2-4 unit building built on them, but where only a 1-unit building is allowed. This map was made possible by the new Zoning Assessment tool on Chicago Cityscape. Read about it or use it now. 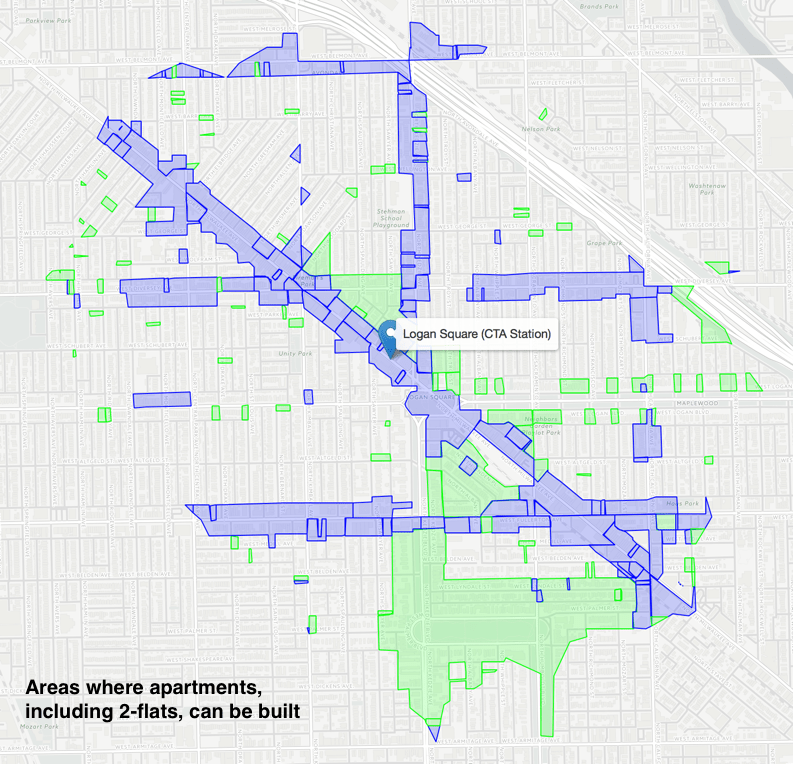 How much of the land within walking distance of a CTA station is zoned to allow multi-family housing? I recently created the Zoning Assessment tool on Chicago Cityscape, which shows a map of aggregated zoning districts in a given community area, ward, or near a CTA or Metra station. Per Paul Angelone’s suggestion, you can now show the walk shed – the area within walking distance to the station, following the streets. The maps in this post show where one can build apartments (including a simple and common two-flat) within a 15 minute walk to the Logan Square Blue Line station, which has 24-hour service. Try it yourself. Thirty-one percent of the walk shed allows multi-family housing. In a second version of the same map, I’ve marked in red the gaps in the zoning map. These are areas that are zoned to allow only single-family housing. That doesn’t make sense: The land near rapid transit stations should be much denser than the land away from the stations. Sixty-four percent of the walk shed allows only single-family housing. The remaining five percent are planned developments (at least the Mega Mall is going to have a couple hundred dwelling units), manufacturing, and parks. And if most of the block is already zoned to allow multi-family housing, why are these parcels skipped? This is the same map as the one above, but with areas that allow only single-family housing marked in red (however, I skipped some areas to save myself time). The walk shed boundaries are generated by Mapzen’s isochrone service. The Zoning Assessment map asks Mapzen for the polygon of a specified walk shed (walk or bike, 10 or 15 minutes), receives the polygon and sends that polygon to a custom API on the Cityscape server, which compares that to the server’s copy of Chicago’s latest zoning map. The comparison is then returned to the browser and replaces the default Zoning Assessment map. A lot of geospatial data (GIS) is stored on ArcGIS MapServers, which is part of the Esri “stack” of products that municipalities use to manage and publish GIS data. And a lot of people want that data. If you have ArcGIS software on your Windows computer, then it can be pretty easy to plug in the map server URL and manipulate and extract the data. For the rest of us who don’t have an extremely expensive license to that software, you can use a “command line” tool (written in Python) on any computer to download any layer of GIS data hosted on the ArcGIS MapServer and automatically convert it to GeoJSON. You’ll need to install the Python package pyesridump, from the OpenAddresses GitHub repository, created by Ian Dees and other contributors. Installing pyesridump is easy if you have pip installed, using the command pip install esridump. The next thing you’ll need is the URL to a layer in a MapServer, and these are not easy to find. I can guarantee the county where you live has one. Before you continue, check to see if your county (or other jurisdiction) has the “open data portal” add-on to their ArcGIS stack. Here are links to the open data portals enabled by Esri for Lake County, Illinois, and Broomfield County, Colorado). This is much easier to browse and find data to download (in shapefile and other formats) and you can skip this tutorial. I don’t have a good recommendation to find the MapServer URL, though. A reader suggested looking for MapServers for jurisdictions around the world by looking through Esri’s portal of open data called ArcGIS Hub. Once you locate a dataset you want, you can find the MapServer URL under About>Data Source on the right side of the page. I normally find them by looking at the HTML source code of a MapServer I already know about. 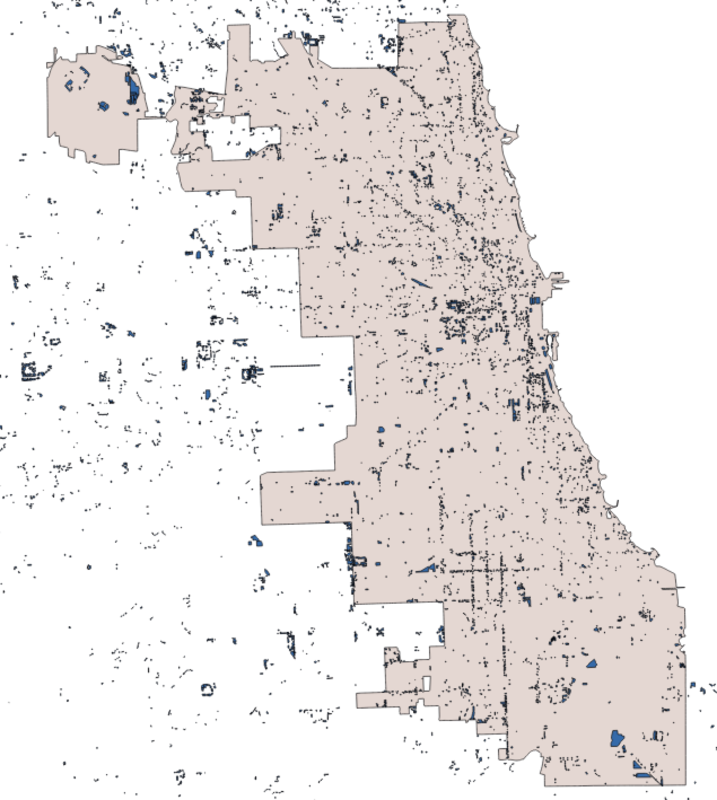 For this example I’ll use one of the GIS layers in the Cook County, Illinois, election service MapServer – here’s the layer for the Cook County commissioners districts. The first term, esri2geojson tells your computer which program to load. The second term is the URL of the MapServer URL. After you enter the command into your computer’s terminal, press enter. esri2geojson will report back once, after it finds and understands the MapServer URL you gave it. When it’s done, the command will “close” and your computer’s terminal will wait for the next command. Do you have questions, or need some help? Leave a comment below. Over on my website Chicago Cityscape I’ve assembled a map of maps: There are 20,432 maps in 36 layers. You might say there are 36 maps, and each of those maps has an arbitrary number of boundaries within. I say there are 20,000+ maps because there’s a unique webpage for each of them that can tell you even more information about that map. This post is to throw out some analysis of these maps, in addition to the simple counts above. The data comes from the City of Chicago, Cook County, and the U.S. Census Bureau. Some layers have come from bespoke sources, including the entrances of CTA and Metra stations drawn by Yonah Freemark and me for Transit Explorer. The sections of the Chicago River were divided and sliced by the Metropolitan Planning Council. The neighborhood and business organizations layers were drawn by me, by interpreting textual descriptions of the organizations’ boundaries, or by visually copying an organization’s own map. There are 6,879 unique words longer than 2 characters, in the metadata of this map of maps. The most common word is “annexation”, which makes sense, given that the layer with the most maps shows the 10,668 Cook County annexation actions since 1830 – the first known plat was incorporated in the City of Chicago. The GeoJSON file, an open source, human readable GIS format, comes out to 30 MB, and it make break your browser when you try to display this layer. The next group of words are also generic, like “planned” and “development”, related to the Planned Development kind of zoning process in Chicago – called Planned Unit Development in other jurisdictions. After that, some names of municipalities that traded back and forth between unincorporated Cook County and incorporated municipalities are on the list. Working down the list, however, it gets really boring and I’m going to stop. I bet if you’re a smarter data science person you can find more interesting patterns in the words, but I’ve also increased the number of generic words (like planned development) by adding these as keywords to each map’s “full text search” index, to ensure that they would respond to a variety of search phrases from users. The dark pink shows areas you can get to within 45 minutes by transit, and the light pink shows you how far you can get within 60 minutes of transit. The transit shed without the Red Line is much smaller! I virtually dismantled the Red Line to show how important it is to get around the North Side via transit. Mapzen, a fantastic company that makes free and open source mapping tools, and for whom I’m an independent contractor, updated its Mobility Explorer map to show where you can go from any point in a city by transit if a piece of existing transit infrastructure didn’t exist. So, I handily took out the Red Line – the Chicago workhorse, carrying 145,000 people each weekday north of State/Lake station. The map shows the analysis, called an isochrone, as if you were departing from the Wilson station in Uptown. You can download the map as a GeoJSON, open it in QGIS, and measure the area in square miles that each scenario covers. Here’s how I know that at least 2.5 percent of the land area in Chicago is covered in parking lots and garages, as of February 5, 2017. That’s a lot of polluted water runoff. I grabbed the land area of 227.3 from the Wikipedia page. I grabbed all the parking lots from OpenStreetMap via Metro Extracts, which is going to be the most complete map of parking lots and garages. Volunteer mappers, including me, drew these by tracing satellite imagery. With the parking lots data in GIS, I can count their area in square feet, which comes out to 160,075,942.42. Convert that to square miles and you get 5.74. The last snapshot of parking lot data I have is from February 2016, when only 3.39 square miles of parking lots have been drawn. There are still many more parking lots to be drawn!